So from Washington, California, North Carolina and Toronto, we've prepared our favorite dishes. Cheesecake has always been a favorite of mine, and when I received a bag of Dulcey 32% White Chocolate from Valrhona, my head started spinning with the possibilities. This chocolate is fabulous to eat straight out of the bag - not gonna lie - but when made into a ganache for the brown sugar cheesecake, it's completely irresistible. I'm excited to share this recipe with you, and I hope you enjoy it as much as I do! May the New Year bring us all a bit closer to the people we love and the things which bring us joy. I'm lifting my dreams a little higher for 2017 and am hoping for a year filled with more travel and adventures. How about you? Bazaar Lazarr, Displaced Housewife, Cook by Color, Husbands that Cook, What Do You Crave, Rainy Day Bites, The Lemon Apron, Abi's Farmhouse Kitchen, No Crumbs Left. 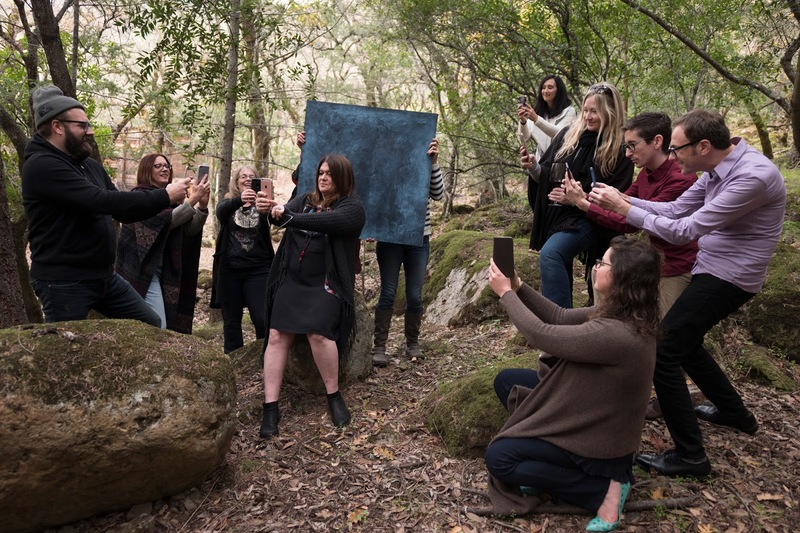 Teri Turner and fellow food bloggers at Calistoga Ranch. Photo by George Lange. Prop board by Erickson Woodworks. In a medium bowl, mix crushed wafers, sugar and butter. Press into the bottom and partially up sides of an 8 - inch springform pan. Place in freezer for about 10 minutes, then bake in oven for 10 minutes. Remove from oven and set aside. In the bowl of a stand mixer, beat the cream cheese and sugar for several minutes until smooth. Add the eggs, one at a time, beating for about a minute after each addition. Scrape the bowl, add the vanilla, and beat for about one more minute. Pour over crust in pan. Smooth the top. Bake for about 55 - 60 minutes, until center has only a very subtle wobble. Turn off oven and crack oven door slightly for one hour. Remove cheesecake and cool on rack to room temperature. When cheesecake has cooled completely, remove from springform pan and refrigerate for 8 hours or overnight. To Serve:Cut cheesecake into slices and serve with an extra swirl of dulce ganache. Note: Warm the reserved ganache in the microwave for about 10 seconds and stir. Repeat, if necessary, until it reaches spreading consistency. * Valrhona Chocolate may be ordered through Amazon. If you don't have Dulce 32% White Chocolate, this ganache may also be made with 70% dark chocolate.